A variable-speed dial provides ultimate speed control from 8,000 ? 12,000 OPM for a variety of projects. One-handed locking dust bag attaches securely to the sander to aid in dust collection or the user can attach the sander directly to the DWV010 or DWV012 dust collectors. Rubber overmold grip provides comfortable sanding. Replacement 8-hole hook-and-loop sanding pad for quick, easy paper changing. 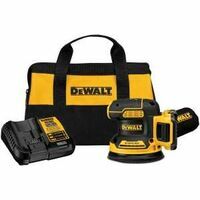 Includes (1) Orbital Sander, (1) 20V Max 2.0 Ah compact XR Lithium Ion battery, (1) 12V Max/20V Max Lithium Ion charger, (1) dust bag and carrying bag. M18 5? Random Orbit Sander delivers 12,000 Max OPM output. 7,000-12,000 variable speed dial allows more control over the output of the tool to match the orbit speed for the application. Powerful motor allows the removal of more material per battery charge. Delivers up to 35 minutes of run-time on a M18 3.0Ah battery pack. Includes: M18 Orbit Sander Kit, dust canister, universal hose adapter, extension adapter, (2) 80 grit sandpaper, M18 Red Lithium XC extended capacity battery, multi-voltage charger, and contractor bag.